Recently I started using RML utilities quite a lot. ReadTrace and Ostress are awesome tools for benchmarking and baselining and many of the features found there have not been fully implemented in SQLServer 2012, though Distributed Replay was a nice addition. 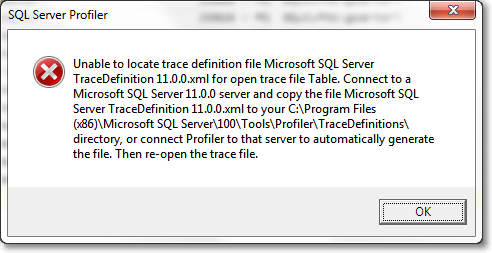 However, as you may have noticed, ReadTrace is just unable to read trace files from SQLServer 2012, so you may get stuck with a trace file you wont’ abe able to process. When I first hit this issue, I immediately thought I could use a trace table to store the data and then use Profiler again to write back to a trace file. Interesting! So, looks like Profiler stores version information and other metadata somewhere in the trace table, but where exactly? 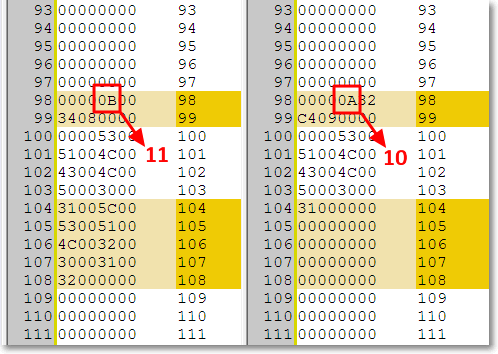 So, looks like Profiler stores its metadata in the first row (RowNumber = 0), in binary format. That was the clue I was looking for! I loaded a trace file in the old format into another trace table and I started to compare the data to find similarities and differences. Hmmmm, seems promising. Can those “11” and “10” possibly represent the trace version? Let’s try and see. The trace table can now be opened with Profiler2008R2 and written back to a trace file. Hooray! Yes, I know, using a trace table can take a whole lot of time and consume a lot of disk space when the file is huge (and typically RML traces are), but this is the best I could come up with. I tried to look into the trace file itself, but I could not find a way to diff the binary contents in an editor. You may be smarter than me a give it a try: in that case, please, post a comment here. Using this trick, ReadTrace can happily process the trace file and let you perform your benchmarks, at least until Microsoft decides to update RML Utilities to 2012. UPDATE 11/08/2012: The use of a trace table is not necessary: the trace file can be updated in place, using the script found here. Posted on November 7, 2012, in SQL Server, T-SQL and tagged Ostress, Profiler, ReadTrace, RML Utilities, SQLServer, Trace. Bookmark the permalink. 1 Comment.